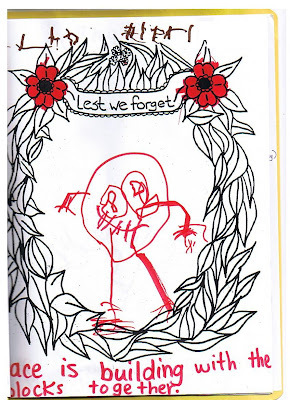 For Remembrance Day BigE colored a page for Remembrance day. They asked the kids what peace means to them. They put them together and gave each family a night with the book. This week we got to see it. It's a little hard to see because of the binding of the book. It reads "Peace is building with the blocks together"
By the way that is a self picture. The one thing I remember BigE telling me that he saw a Daddy movie. After asking him what that meant; it turned out that it was not a cartoon. About a guy who "got killed"